Jeff Johnson recounts the journey of his heroes Yvon Chouinard and Doug Tompkins to Patagonia in 1968. 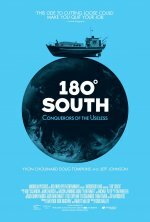 180° South release date was Friday, May 21, 2010. This was a Limited in theaters release. added the tagline: "180 Degress South"